The baroque Frauenkirche (engl. Church of Our Lady) replaced an old church from the 11th century in 1722 . Its cupola became famous as the ''Steinerne Glocke'' (engl. stony bell). 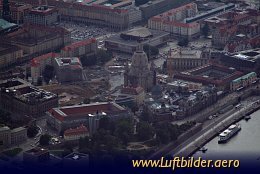 It dominates the skyline of the historic Dresden. In 1945 the Frauenkirche was completely destroyed and rebuild with donations a few years ago.